Two years ago, my husband surprised me with my first sewing machine. I never took home ec, had no idea how a sewing machine worked, but was thrilled to be able to try. I was quickly addicted and the rest is history. 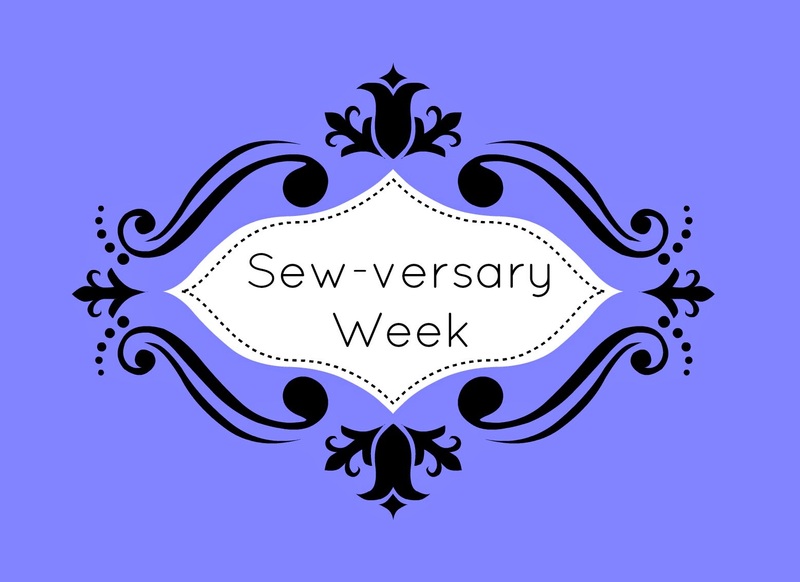 Join me this week as I celebrate my sewing! Last year on my Sewversary, I reviewed my Brother CS-6000i sewing machine. It's now been a year since I received my Brother 1034d serger (another Mother's Day gift!) and I figured it would be a good chance to offer a formal review of the machine. One of my goals in the last year was to learn as much as I could about my serger. I'm fairly certain I've used all of the common stitches (3-thread overlock, 4-thread overlock, rolled hem, flatlock) and even explored more of the uncommon uses (hellllllo easy gathering!). So I hope I'm qualified to give a proper review! Sergers use a combination of multiple threads (mine uses a max of 4) and needles (max of 2) to create loops and stitches along a fabric edge. A knife is installed within the machine, which cuts the seam allowance off as you sew. The tension on each thread can be manipulated (as well as the length and width), which results in different kinds of stitches being possible. The Brother 1034d is probably the most popular/common serger out there. It's inexpensive (as sergers go) but has a lot of functionality. Is it intimidating at first? Yes. It is. Not gonna lie. But take a deep breath, block out distractions, and you'll be threading and serging in no time. And once you serge, you'll never go back! There are other models that offer these features, but I haven't "needed" the 2 and 5 thread stitching thus far. I have a separate machine for coverstitching. Sews knits like it's its job (it is). Finishes woven seam allowances quickly and neatly. Personally, I've had zero mechanical issues in a year of decently heavy use. Any time something wasn't working properly, it was usually my fault (threads tangled while threading, bad tension settings, dull needle). Uses the same Schmetz needles as my Brother CS-6000i. Some sergers need special needles. Did I mention the knits thing? It's loud. Having no experience with any other sergers, maybe they're all loud, but somehow I doubt it. There is a learning curve with threading, however remember that two of the four threads are NEEDLE threads. No different than your sewing machine. In reality, you're only learning how to thread two new things (an upper looper and lower looper) and they aren't that bad. It's heavy. This is kind of a pro, because a serger sews very quickly and you don't want the machine vibrating itself off the table. But if you don't have a dedicated sewing room and will be packing/moving/unpacking it all the time, you'll want to consider the weight. This is nit-picking, but both needles are tightened/loosened with the same set screw. It can be a bit tricky to get two needles in without dropping one into the guts of the machine. There is a special tool for holding needles that can make this easier (I do NOT have it but still manage). Would I recommend this serger? Hands down, yes. If it got hit by lightning and I needed to buy another? I'd buy this one again (and hey, it could happen...our house was hit last year). My suspicion about sergers is that most people will probably be brand-loyal when it comes time to buy one. The biggest question is not WHICH serger, but do I NEED one in the first place. Once you decide your use will justify the cost, you'll probably be happy with a serger from your favorite brand. Personally, I enjoy having 3 Brother machines. Owning the 1034d made learning about my coverstitch machine MUCH easier. So, do you need a serger? If you sew knits, yes. It's not a popular thing to say, but all the "tricks" to using a regular machine are just that, tricks. You CAN paint a house with a brush, but wouldn't a roller be easier? The right tool for the job DOES make a difference. There, I said it. I understand that everyone has their own limitations with funds and space, but I'm not going to pretend that sergers aren't awesome. Once you have a serger, a little education can go a long way towards making you feel comfortable. My machine came with an instructional DVD in addition to a manual, and I did watch the DVD. It helped. I highly recommend the Beginner Serging class on Craftsy. I bought the class myself and still access it now and again. It was worth taking just for the opportunity to see other sergers and how they work. I also had trouble one time and posted a picture to the class, and received a reply from the instructor. You can also read about the three serging books I recommend, here. This post contains affiliate links. The thoughts and opinions in this review are my own. I've been considering this machine for awhile. It's actually on my wish list in Amazon. I have an old Bernette 234 my husbands granny gave me. That thing is a workhorse and I love it however it doesn't have a stitch width adjustment and it's a pain to thread.